Nothing churns the entrails of the professional democracy priesthood more than the rancid taste of a little real democracy. Since one of the main dishes on the 1992 political menu has been a generous serving of authentic popular rebellion, the sages have spent a good part of the last year lurching for their lavatories. The very same brahmins who demand democracy in all its terrors in Peru and South Africa turned green at the prospect of Americans actually beginning to think about and support candidates, parties, and ideas all by themselves, and the self-appointed caste that tries to make sure nobody gets to see the wizards who run the country in the Emerald Cities of Washington and New York put their noggins together to keep the masses at bay. Having worked themselves into a lather over David Duke all fall, the brahmins were disappointed that the former Klansman did not provide more sport once the campaign actually began, but the venom they had stored in their fangs for Mr. Duke they spent instead on what they took to be a reasonable facsimile in the person of Patrick J. Buchanan. Perennial Men of the People such as Jerry Brown and Tom Harkin inspired only amusement, but Mr. Buchanan’s candidacy unleashed a flood of poison that rose higher every time he kissed another baby. Nevertheless, though Mr. Buchanan never won a primary, he was the undoubted star of the presidential campaign, and what he did accomplish is something that few if any professional politicians have achieved since World War II. It is rare that any candidate challenging an incumbent president gains more than 10 to 12 percent of the popular vote in his own party’s primaries, but there are some precedents for it. What is unheard of is for a challenger who is not a professional politician to win that many votes and indeed to take no less than a third of his party’s supporters against a sitting chief executive. Mr. Buchanan has never held public office and has never before run for election for anything, yet in the primaries through Super-Tuesday, he consistently won more than 30 percent of the vote against a man who has spent his entire life flapping from one public nest to another and who a year before had enjoyed such high levels of popular favor that those Americans who didn’t support him probably didn’t know who the president was. The conventional brahminical interpretation of the Buchanan following is that it was a “protest vote,” a phrase that explains little and raises several more questions than it answers. “Protest” against what exactly, and why should any large number of voters be disposed to protest? To be sure, there are perpetual malcontents in every party who are ever disposed to vote against whoever holds office, but no serious political observer believes that they compose anything like a third of a major party that has held the White House for 12 years. The reason for Mr. Buchanan’s strong showing in the primaries is closely related to the reasons for the extraordinarily poisonous verbiage directed at him from the day he announced his candidacy. Indeed, the one is a kind of mirror image of the other, for it was exactly what attracted the rank-and-file voters to him that repelled the brahmins and their entourage. Of course, there were several different specific elements that fed the smear campaign against him. Zionists and many American Jews appeared to be obsessed by the delusion that Mr. Buchanan was an anti-Semite, had denied that the slaughter of Jews by the Nazis had occurred, and had expressed admiration for Adolf Hitler. For obvious political reasons, the Bush administration, usually on the sly, seized every opportunity to encourage such lies, even as Mr. Bush and Secretary of State James Baker were raked by similar accusations because of their opposition to Israeli housing policy in the West Bank. In addition to the prepossessions of some Jewish obsessives such as Abe Rosenthal, Norman Podhoretz, and Charles Krauthammer (but by no means all or even the general run of Jews, since some of Mr. Buchanan’s most outspoken defenders against these lies were themselves Jewish, such as Human Events‘ Allan Ryskind, Murray Rothbard, Paul Gottfried, Robert Novak, and Michael Kinsley), there was the general fury directed by the Left against any serious conservative or anti-liberal. In this respect, the vilification crusade against Mr. Buchanan was not qualitatively different from those of the past directed against Joe McCarthy, Richard Nixon, Barry Goldwater, Ronald Reagan, and Jesse Helms. But the canards cast at Buchanan reached a pitch that earlier ones tossed at prominent conservatives had never attained, and when supposed conservative leaders such as William Bennett and Newt Gingrich joined in the baying of the pack, it was clear that something different was going on and that the authors of these mendacities had perceived some quality in the Buchanan movement that disturbed them more than usual. What they perceived was in fact the emergence of a new identity in American politics, one that the high science of managed and manipulated democracy is not yet quite prepared to handle and which is therefore more of a threat to the established powers than almost any previous challenge from the Right or Left. 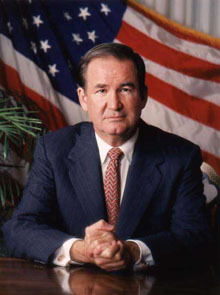 Despite his background as the nation’s most prominent conservative commentator, Mr. Buchanan presented himself as a bit more than a conventional conservative candidate, and the really significant aspects of his campaign were precisely those that departed from the mainstream of what has declaimed itself as conservatism in recent years. The themes of “America First” and the “Middle American Revolution” that Mr. Buchanan articulated appealed to a particular identity, embodied in the concepts of America as a nation with discrete national political and economic interests and of the Middle American stratum as the political, economic, and cultural core of the nation. In adopting such themes, Mr. Buchanan decisively broke with the universalist and cosmopolitan ideology that has been masquerading as conservatism and which has marched up and down the land armed with a variety of universalist slogans and standards: natural rights; equality as a conservative principle; the export of global democracy as the primary goal of American foreign policy; unqualified support for much of the civil rights agenda, unlimited immigration, and free trade; the defense of one version or another of “one-worldism”; enthusiastic worship of an abstract “opportunity” and unrestricted economic growth through acquisitive individualism; and the adulation of the purported patron saints of all these causes in the persons of Abraham Lincoln and Martin Luther King, Jr.
None of these idols has much to do with the central task of an authentic conservatism, which is the survival and enhancement of a particular people and its institutionalized cultural expressions. All of them are instead universalist banners that can be fluttered by Pakistanis and Patagonians as easily as by Americans, and whatever their merits (which are very few) there is nothing in them that distinguishes us as a particular people, a particular nation, or a particular culture. Collectively they constitute what Professor Claes Ryn of Catholic University has recently called the “New Jacobinism,” and it is hardly accidental that their more literate exponents (such as Allan Bloom) explicitly and properly root their creed in the Enlightenment of the eighteenth century, an era that historically has been repugnant to traditional conservatism but is intimately embraced by the universalist cosmo-conservatives. Nor is it is surprising that the political Left is enchanted by this redefinition of the Right in universalist terms, since the redefinition promises a Right that is philosophically indistinguishable from the Left itself, a Right that can sooner or later (probably sooner) be pushed to the same practical political conclusions that the Left has reached from the same premises, at which point there will be no serious ideological opposition to the Left and its dominance at all. Hence, both the Left and the cosmo-conservatives were eager to join forces in trying to muzzle Mr. Buchanan’s “New Nationalism” as soon as it began to bark, for they correctly saw it as a threat to the cultural uniformity and hegemony that the Left and the universalist Right demand for themselves, and it was the anti-universalist aspects of Mr. Buchanan’s message that informed the most notorious denunciation of him by Mr. Bennett last winter. Mr. Bennett’s accusation, in response to a question from George Will, was provoked by a column by Mr. Krauthammer attacking Mr. Buchanan, and the whole trio of cosmo-conservatives denounced Mr. Buchanan’s “flirting with fascism” — that is, his assertions of economic nationalism, his criticisms of unrestricted immigration, and his supposed “racism” in criticizing Israel and defending a foreign policy centered on American national interests. To cosmo-conservatism, this is precisely what fascism is, the invocation of the claims of the particular over those of the universal. In an earlier column, Mr. Will had criticized Mr. Buchanan for failing to “understand what distinguishes American nationality.” “Ours,” Mr. Will intoned, “is, as the first Republican president said, a nation dedicated to a proposition.” It is the characteristic proposition of political universalism that the heritage and meaning of historically distinct nations, cultures, and peoples can be captured in and by propositions that are universal in their application, and the rejection of such propositions is to the universalist mind at best tribalism and at worst the stuff of which gas chambers are made. The inconvenient historical truth is that genocide and modern ideological tyranny have far more often been the product of universalism itself, especially its egalitarian incarnations, than any assertion of particularist loyalties and identity. But the main threat presented by Mr. Buchanan and his own tribe was not merely their expression of an anti-universalist doctrine and agenda but the wide appeal these expressions enjoyed. The irony of the New Nationalism is that its explicit particularist and nationalist appeal to distinctively Middle American values and interests lifts it out of the ghettoes and cloisters that have been the natural habitat of the American Right since World War II. Mr. Buchanan suddenly found himself speaking to sympathetic audiences of factory workers, students, and middle-income voters whose interest in and comprehension of the esoterica of conservative metaphysics has always been as minimal as their commitment to the sonorities of the Left. For the first time since the Depression perhaps, there loomed the prospect of a unified people transcending the artificial and obsolete framework of Right and Left and militantly intent on dislodging the reigning elites to take power back to their own bosoms for their own purposes. Today this is known as “fascism”; it used to be called “democracy,” which is the real reason the Left-Right establishment is so frightened by it. Yet in the end, for all their lies, there is not a great deal the incumbent elites can do about Buchananism, and they must be experiencing much the same exhilarating emotions that French and Russian aristocrats enjoyed when they listened to the somber sounds of tumbrels in the streets of Paris and St. Petersburg. No one imagined that their campaign of vilification had much political consequence, and it was mainly through reliance on the natural advantages of presidential incumbency that the Buchanan revolution was momentarily frustrated. But no one should imagine either that the revolution is over. Indeed, Mr. Buchanan’s presidential campaign was only the opening shot, and whether he runs again or does or does not eventually win the White House, he has unleashed a force in American politics that cannot be bridled. Its main mission now is to embark on a long march that will popularize and legitimize its claims to be the vehicle of a reborn national consciousness, and that mission is only in part political in the narrow sense. As a great global democrat once said, a house divided against itself cannot stand, and the main message of the Middle American Revolution is that the real masters of the house are ready to repossess it and drive out the usurpers. This article was originally published in Chronicles Magazine in July 1992. Published: April 2, 2018 | This entry was posted in North American New Right and tagged 1992 presidential election, America first, articles, Chronicles Magazine, civic nationalism, conservatism, George H. W. Bush, Israel, Left/Right divide, neoconservatism, North American New Right, Paleoconservatism, Patrick Buchanan, populism, reprints, Republican party, Samuel Francis. Both comments and trackbacks are currently closed.